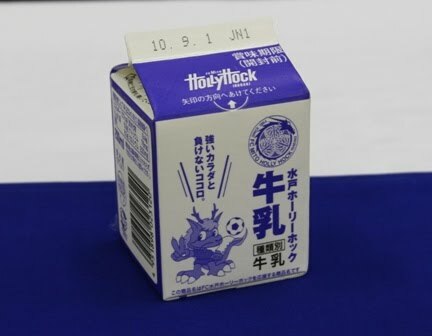 All the public elementary and middle schools in Mito city, Hitachi city, and their 12 suburbs will now receive Mito HollyHock branded milk carton with each student lunch. If any OCD-level J. League collectors are out there, you shouldn't consider this a rare item... More than 100,000 will be given out each day, which means more than 6 million will be distributed this term, and the arrangement may be continued afterward. It will also be available in certain stores in north Ibaraki.